Preheat oven to 350 degrees. Lightly spray or oil a 9x13-inch baking pan. Combine figs, walnuts, sugar, orange juice and hot water in a mixing bowl and set aside. Mix together margarine and brown sugar until creamy. Add egg and mix until smooth. Mix flour and baking soda. Stir into egg mixture. Blend in oats to make soft dough. Reserve 1 cup of dough for topping. With floured fingertips, press the remaining dough into a thin layer on the bottom of baking pan. 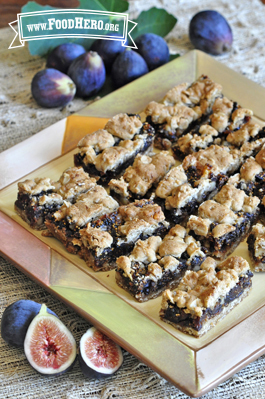 Spread fig mixture evenly over the dough. Crumble reserved dough over top, allowing fig mixture to show. Bake 30 minutes or until golden brown. Cool completely in baking pan. Cut into 24 bars (about 2.5 x 2 inches).